I AM FUEL, YOU ARE FRIENDS: Gorgeous new Beach House video :: "Used to Be"
Gorgeous new Beach House video :: "Used to Be"
The saturated desert hues and retro motel settings of this video (shot during a recent West Coast tour in the desert outside LA with director Matt Amato) are visually stunning. The fact that this is such a marvelous song makes it even better. Baltimore duo Beach House remind me of a female-fronted Fleet Foxes on this outing: a lot of space inside the song, a haunting build, but with that persistent and anchoring tambourine rhythm. Following their sophomore album Devotion earlier this year, Beach House just released a new limited-edition 7" with this song on the a-side, and the b-side featuring a 4-track demo version of "Apple Orchard" (from the Beach House S/T album) recorded three years to the month before the new song. 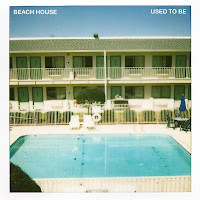 The b-side is one of the first things Alex and Victoria recorded together as Beach House. Their third full-length is anticipated sometime in '09. wow-i loved that. thx for sharing!